Just as you thought that there couldn’t be any more awards given after the basketball seasons over, think again. Senior basketball captain Amy O’Neill was selected to the All-ECAC (Eastern Collegiate Athletic Conference) honorable mentioned listing earlier today. During her senior campaign at St. Francis, Amy finished the season with 10.1 points, 6.9 rebounds, and led the NCAA in assists with 8.6 assists per game. She also set the program record in assist throughout a single season with 268 assists. The previous record holder was held by Ericka Norman back in the 2013-14 season. O’Neill also became the first player in program history to record a triple-double in a game. On February 2nd in an overtime win against Sacred Heart University, Amy finished the game with 13 points, 13 rebounds, and 12 assists. Two weeks following that performance, Amy put up yet another triple-double (16 points, 11 assists, and 10 rebounds) in a win over our conference rivals, LIU Brooklyn. 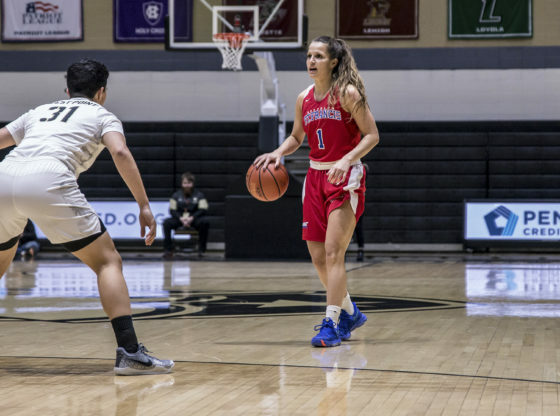 By the time Amy finished her career with the St. Francis Brooklyn Terriers, she ended up placing 7th all time on the all-time assists listing with 409 in two seasons. The Australian guard was also named to the All-NEC First team following her dominant performance during the regular season.